Who would have expected that what is perhaps the most widely used, 5-stage clinical model of grieving and “change management” could be applied to stages of customer service crises? But that’s a good model of what frequently seems to happen when clients give customer service staff “grief” (or vice versa). Intriguingly, that model also often seems to apply to the sequence of events and stages that unfolds when customer service goes awry, even though the kind of “grieving” displayed is, on the customer service rep side, over business losses, rather than personal sorrow. In many instances, as I will illustrate below, even though the full five steps are not observed, a truncated sequence occurs, e.g., a pattern consisting of only some or most of the five recognized steps or stages of grieving. In such cases, the stages are passed through by customer service staff as “grief” over (potentially) lost revenue and clientele, stress from customers “giving them grief”, and possibly, later, grief over losing their very jobs, although the model accurately captures the behavior of customers and clients as well. 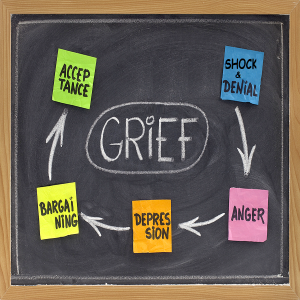 Ironically, despite expert disagreements about the goodness-of-fit of the Kübler-Ross model to the facts and experiences of grieving, it may serve as a quite useful paradigm in customer service contexts, including those related to loss of goods or services. For example, upon being informed that one’s beloved mint-condition, presumably safely parked 1960 Jaguar XKE has been totaled by a load of steel dropped by a construction crane, the vintage-car owner, following this5-stage pattern, will be expected to first experience shock and denial, manifested as a stunned and gaping “What!!? ?”—an expression of mixed shock and disbelief, in the form of an “Oh no!” moment and phase (“But I left it in the paid parking area only twenty minutes ago!”, “Construction cranes never drop anything!”). The next stage is seething anger, e.g., rage against whatever or whomever is now perceived as the victimizer, e.g., the crane operator, or against callous Lady (Un)Luck, an indifferent universe or against the Unfairness of Life. Presumably, this anger can be self-directed and sometimes disguised, e.g., as guilt, shame or self-loathing, “I am such an idiot to not have noticed the crane!” If his insurance company denies or delays compensation, his anger will find an additional target. After this comes negotiation: “I’ll pay an auto-repair shop anything to have it restored!” or “If it can be salvaged or replaced, I’ll pay double the insurance premium if I have to!” Ditto for the insurance company and dealings with its customer service reps or his agent. The fourth stage, depression, follows upon realizing that attempts to negotiate have failed, that the Jaguar will not be replaced in any sense, e.g., emotionally or by insurance coverage. An enveloping sense of helplessness and hopelessness sets in. But, fortunately, there is the more positive 5th-stage resolution, acceptance, which may occur at any point on a spectrum ranging from serene acquiescence and understanding of one’s fate or helpless resignation (minus venomous bitterness, which, after all, is only a variant form of anger). Examples: “Que sera, sera…” or “I needed to bike more anyway….” (the latter being rationalization as a form of acceptance). On the business side, the resolution may take the form of a resolution to get a better policy and agent. A truncated version of the process, e.g., one that stalls at anger, may unfold after the Jag’s owner discovers that his insurance won’t cover the damage, and emotionally and cognitively moves past the shock and denial to the next stage. Although such truncation is likely to be temporary, given the human hunger for “closure”, theoretically it could persist indefinitely, in the form of something like a Hatfield-McCoy inter-clan battle and vendetta, between client and company, their respective lawyers, or the Jag owner and the insurance company’s customer service reps, agent, body shop, etc. Interestingly, the customer service model of grieving can apply to either or both of the two parties in customer service interactions–the customer and/or the customer service staff. While the example of the Jag owner was client-side and hypothetical, my experience with customer service-side multi-stage “grief” during a 2012 trip through Ireland was very real indeed. Everyone I had met at the small and quaint Irish hostel was welcoming, warm and otherwise friendly: The affable owner (who had to leave on an errand), the two kind staff assistants, the two long-term guests and the two nuzzly-waggy dogs that bonded with me immediately. The trouble started when I spoke with the manager, who arrived later in the day. Because the room I was given was as cold as the radiator and the glass of the window (on January 25th—in what is called by most of the Irish and me “winter”), I enquired as to when the heating would be turned on. Told by both the other staff members and later by the manager that it is “on a timer”, I looked forward to not having to sleep in a meat locker, or, more importantly, without having to try to type while wearing gloves. Since, at the stated time, the radiator did not warm up or even begin to, I asked again and suggested that the control valve might need to be examined (since that was in fact the problem at a hostel I stayed at previously—and one that was immediately addressed and resolved). The manager repeated that “it’s on a timer”, adding that it would heat up soon. Two hours later, the conversation had to be repeated, since the radiator was still a cold tombstone of a slab. Instead of confirming that the radiator was or wasn’t working, or at least touching it as a test, or offering to investigate, or apologizing for the inconvenience, or confessing that it was being kept off as a cost-cutting measure, the manager ignored the real issue (in an early manifestation of denial) and dismissively suggested I pile on another duvet (like some of the other guests huddled in the presumably equally heated TV room under sleeping bags or encased in a winter coat). We froze, despite his insistence that the heat was “switched on”, as though that is synonymous with “heat on”, when heating systems are notorious for malfunctioning (a second manifestation of denial). Another two hours later, at 11 PM, after the dark and cold had thoroughly kicked in, while the heat had not, I pointed that out to him. This time he came up with an ingenious solution: Visibly irritated, he at first suggested, then told me, I should leave (as he advanced to the “anger” stage). It’s also true that he tried to get me to accept blankets as an alternative to heat. But, in that context, it turned out to be a form of denial, rather than negotiation, since he explicitly added “the room isn’t cold”. My counterattack, or pseudo-counter-offer, was to forfeit the first night’s payment and to leave immediately, rather than freeze and be forced to stay in a “hostile” (rather than the welcoming hostel I expected)—which was exactly what I eventually did when he appropriated and packaged my offer as his own quasi-ultimatum. Acceptance, by either of us, of our respective grief was mixed: I accepted the loss of a hoped-for pleasant stay and some cash and turned it into a plus—rumination on and writing of this article. However, I suspect that he never warmed up to the idea of accepting the situation or even recognizing the loss, much less any responsibility for it (even if he has managed somehow to physically warm up). He told me to take the balance on the three nights I had paid, minus that night’s payment, and leave the next day. That may seem like a negotiation gambit, but, since it was “offered” on a very hostile, take it or leave it basis, it was more like an ultimatum or declaration of war. If he experienced depression, it was packaged as exasperation—although I can’t rule out that he woke up depressed the next morning, but then accepted the loss of revenue and possible lost ground with his boss, who is unlikely to have been pleased with the lost income at the low-season, deadest time of year, business-wise. I indeed left, as I embarked on my parallel march through the same stages and comparable emotions. Tell your clientele or allow them to assume that you provide a service or product. Notice that genuine depression has no correlate in this model or in my encounter. One reason is that the pace of real-time business interactions and stages, e.g., in a customer service call, is too fast for depression to set in, the closest approximation being ongoing frustration in the face of an obstacle or perceived loss.Another reason for the absence of depression is that its associated helplessness is a luxury that cannot be afforded by accountable staff in a time-is-money business environment and interaction. The great lesson here for all customer-service staff is this: If you start up the grief staircase, do the full climb to acceptance and resolution. If anger seeps or leaps out, rein it in, negotiate, e.g., do your job and check the heating system, or offer an apology for the lack of room heat and personal warmth. Work toward a mutually acceptable acceptance of the circumstances. If the full-5 is too much for you or tactically unwise, skip the anger and depression (which is normally unhelpful anyway) and shoot for a truncated 3-stage process of attenuated grieving that very closely resembles the kind of “resilience” that Kübler-Ross’s critics insist is more common than grieving : shock (ideally without denial, but with allowable skepticism), negotiation, acceptance. ….unless you like merry Irish wakes.